LinkedIn Made Easy: Business social networking simplified is now in it’s 3rd Edition and is an Amazon Bestseller in the UK. It has been fully revised and updated for 2013. It includes all the latest updates to this professional network of choice. New sections include how to set objectives and put a strategy in place. New chapters show you how to use the opportunities presented by the brand new profile layout, company pages, LinkedIn Today and much more. It’s worth bearing in mind that, although the front end look of a social network changes, the basic principles behind good online networking never do. Once you get those under your belt you can apply them time and again to different networks, different audiences and different opportunities time after time, after time. 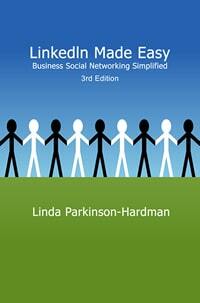 LinkedIn Made Easy is the ideal companion for the new and veteran online networker. Whether you are a solo professional looking to forge alliances with others, the marketing director of a large multi-national conglomerate, a small business owner or a student looking for their first job; LinkedIn offers something for each of you to help you achieve your goals. With lots of helpful information about each of the main elements of LinkedIn, a strong focus on the use of free accounts, plus a handy set of ‘Recipes for Success’ for every occasion; LinkedIn Made Easy will have you developing your personal and business strategy in record time.